How much knowledge do you need? Zong Yuan Zhao - First GM Norm! Not that this award carries any significance outside the readers of this blog, but I though it a nice way to end my first year of blogging. There were a couple of outstanding candidates in Australian chess this year, in Zhong Yuan Zhao and David Smerdon. But having lauded the performance of these two future GM's, it is to a third player I turn. 2007 saw Ian Rogers retire from competitive play. It was somehow fitting that in the year of his retirement he won the Doeberl Cup, a tournament he has won a record number of times, and finished his last tournament in Adelaide in first place. His retirement, while a loss for Australian chess, brought into focus the massive contribution he has made to the chess culture in this country, and for this reason he gets my nod for 2007 Australian Player of the Year. One of the requirements for organising an event on behalf of the Australian Chess Federation is to provide a report to the ACF Council at the end of the event. The ACF by-laws specify what is to be included in the report, eg financial statement, results, and any disciplinary recommendations. The organisers of the 2006-07 Australian Open dutifully submitted the report to the ACF (recommendations and all) but up until now we haven't had a response. No follow up questions, no queries, and most sadly, no apparent actions on the things we highlighted in the report. I can only assume that the ACF decided the detail we provided them was perfect, while the observations we made required no action. And given 6 months has past since the report submission, I'm also assuming that it is safe to release it in the public domain (after all, Stephen and I did write it). So if you click on the link http://docs.google.com/Doc?id=drvkdd2_1d66qmnzw you can read the report yourself. (NB This is the first time I've published something in Google Docs, so fingers crossed). To be honest there isn't anything dramatic in the report. Just the usual run of the mill reporting, although Stephen's observation on the number of players entering the event should be read by any prospective tournament organiser. Due to a coincidence of holidays and geography, three quarters of the Papua New Guinea Olympiad team played in Street Chess today. 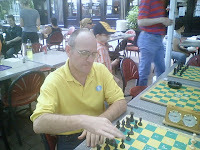 Stuart Fancy (pictured) , Shaun Press and Craig Skehan were part of the 22 players who took part in the end of year edition of Canberra's weekly outdoor chess tournament. Also playing was Vladimir Smirnov (visiting from Sydney) and the "unofficial" World Under 6 Chess Champion, Anton Smirnov. Overall there were 5 players with 2000+ ratings. In the end Vladimir outclassed the field with 6/7 (5 wins, 1 draw and a half point bye), half a point ahead of the second place getters. The PNG team finished mid field (4/7 by Press and Fancy), although Stuart Fancy did confirm the board order for next years Olympiad in Dresden by defeating Press in their individual game. Street Chess runs every Saturday in Canberra City, and to bring in the new year, the three PNG players will be playing next Saturday as well. As promised, my game from the chess exhibition in Commonwealth Park just before Christmas. As with any public demonstration it is hard to judge the ability of the player in front of you, and although I suspected my opponent had a fair idea of what he was doing, I still played an unsound sacrifice. Of course I didn't know it was unsound, even going so far as to say "This should work" as I played Nxf3. Of course it didn't and I was just down a piece. Fortunately for me my opponent missed my plan of f6 and g5, trapping the bishop on h6. I then offered a draw by repetition with Kg6-f7-g6, but my opponent played on for a win. Unfortunately it didn't quite work for him. In my journeys to west of Canberra I often pass through the town of Harden. A few years ago an excellent second hand bookshop opened up, and I always drop in (to the annoyance of my wife and kids). There aren't many chess books there, although if you are a bridge player you will have more luck. What I usually buy there are a couple of volumes of Patrick O'Briens "Captain Jack Aubery" series. For those that don't don't read, it is the source of the film "Master and Commander" with Russell Crowe. In the fourth book "The Mauritius Command" chess gets a mention. Unfortunately the excellent research skills O'Brien brings to his books didn't extend as far as the royal game with the following line getting past his editors. An interesting concept, and one I've not witnessed myself. One of my chess ambitions is to one day play in the Hastings International Chess Congress. This may have to wait until I retire (or win Lotto) and for now all I can do is follow the event from afar. Sadly the reality of chess finances means that there is no longer a separate GM Round Robin, with the Hastings Masters a large, although still strong, swiss. The most recent list of entries had 17 GM's in the field of 102 players. Alongside the masters is a number of subsidiary events which have attracted good fields. The home page for the event is http://www.hastingschess.org.uk/ if you, like me, want to follow the event on line. Thank you to all the kids from Saturday Morning Chess who gave me Xmas presents. It will take me a month to get through all the chocolates! I hope everyone else got the presents they hoped for (or at least deserved), and the presents they gave were greatly appreciated. And it wouldn't be Christmas without a Christmas puzzle. So here is a famous puzzle by TR. Dawson. White to play and Mate in 2 (and yes, it is an upside down Christmas Tree). When I first started getting serious about chess, one of my earliest book purchases was "Exploring the Chess Openings" by Hugh E Myers. Myers is well known as a practitioner of offbeat openings, and the book was a collection of his games. Included in the book was a wonderful piece of advice on the Sicilian "This only works for Black if White misplays his kingside attack". Also included was the following game, apparently played the "night before Xmas", and involved both players having a few drinks beforehand. Myers was particularly proud of the fact that he gambitted 6 pawns in the first 10 moves. BTW If you go looking for this game in Chessbase it lists it as having been played by correspondence in 1988. This is wrong, as I certainly saw it in print in late 1982. If you ever get asked to do a chess display/simul/challenge against the general public, chances are you will be playing people who may know the rules (although not all of them*) of chess, but not much more. Therefore you will often be asked to give some general advice or tips on how they should play. What I have found is that even simple advice to the aspiring chessplayer (occupy the centre, checks and captures etc) tends to be a little complex and even simpler advice is needed. After you move, your opponent gets to move. What this means is you shouldn't try moves/ideas that only work if you opponent doesn't move at all all. An obvious example is if a black pawn pushes to h2, in an attempt to Queen. White should stop it by playing a rook to the h file, not by playing a rook to the second rank. Sure, if Black didn't move the pawn again then Rxh2 would be good, but given that Black has played h5-h4-h3-h2, h1(Q) is probably on the cards. Pieces that do more are worth more. I've seen novice players decide that capturing 2 pieces/pawns for 1 is always a good trade, even if the sequence goes NxP, PxN, BxP. Rather than getting players to remember 1,3,3,5,9 as the value of pieces, it is often simple to start with "Queens best, Rooks next, Bishops and Knights the same, then pawns last"
If you can't think of a move, choose a piece you haven't moved yet. Clearly this is a piece of opening advice, but it also helps players realise that moving the same piece over and over is just a waste of time. You can even upgrade this to "Move the piece doing the least" with little pain. Threaten two pieces at once. This exploits the fact that most non-players are so pleased that they can spot one threat that they don't even look for another. Of course it doesn't normally work against good players but against players of a similar ability it is often enough to start collecting enemy pieces. *I'll always point out checks when a player fails to spot that his/her King is attacked. I'm also happy to explain castling. However if I player leaves an en-passant capture for me, I'll almost always ignore it as this is the one rule guaranteed to cause confusion (if not accusations of cheating! ), and it just isn't worth spending 5 minutes explaining it. However if life serves you lemons etc so I took the opportunity to give the ACT governments giant chess pieces a good scrub. 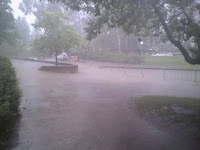 In the meantime the festival organisers made the sensible decision to delay the start until 6pm. Returning at 6pm there was a steady stream of punters ready to play some chess. The quality of play was mixed, but I almost came undone against a former Canberra junior (game to follow in a later post). Overall everyone enjoyed the experience, and it was just a shame that the weather cut the playing time from 8 hours to 2 hours. One reason I'm in favour of "banded" Round Robins (and RR's in general), is that I believe they result in more accurate ratings, and ratings changes. Unlike swiss tournaments, the field you play is fixed in advance and rating performances depend more on results and less on the field you play. Imagine you are an "improving" player. By "improving" I mean you've reached the stage where you can beat everyone lower rated than you (even 1 point lower), score about 50/50 with players up to 100 points above you, but still can't beat players above that. Now you play a typical 7 round swiss, where you happen to be seeded about 10th out of 35 players. This means you win the first round , lose the second , wins the third, lose the 4th etc (a typical Swiss bounce tournament) . Now it turns out that you finish on 4/7, but it also turns out that the average difference between you and higher rated opponents is 150 points. On the other hand the tournament has a long tail, and the average difference between you and your lower rated opponents is 300 points. So the average rating of your field is 107 points below your rating. Under the ELO system your expected score is 65%, but in this case it is only 57%, resulting in a drop in your rating. Now sure, it can be argued to maintain your rating you should have scored 30% (almost 1 point) against your higher rated opponents, but this is far more difficult than say dropping a point against a weaker opponent. Now imagine the same tournament as a RR where your are in the second group, with only 1 opponent rated above you (and probably close to your rating), and the rest below you. Under these circumstances you score 6/7 and up goes your rating. So why the difference? Basically in a swiss you will always play someone N/2 places away from you in a score group of size N. If N stays large you often play someone either too easy or too hard (from a ratings point of view), and only rarely will you play someone close to your rating. In a banded RR you get to play players close to your rating and therefore your rating change depends mainly on your score, not your (unpredictable) field. 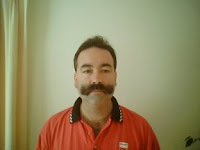 Normally I plug tournaments closer to home, but I'd like to make mention of the 2008 Queensland Australia Day Weekender. It is running over the Australia Day Weekend (26-28 January 2008), and is trying a multiple Round Robin format for the first time. Not just the first time for this event, but possibly the first time for any Australian weekend event. The format has the 10 highest entries in RR 1, then next in RR 2 etc The advantage of this format is that for most RR's you will be playing players of your own strength for prizes, so no lucky/unlucky pairings to trip you up. The only exception might be the top section with the higher rated players being 200+ points ahead of the middle of the field, but event then the opportunity to play a RR event with such good opponents shouldn't be sneezed at. I hope the tournament is successful, and the format is well received. Too often chess players complain about how unfair the existing swiss system is on them (tournament 'bouncing' or tough last round opponents), but at the same time shy away from trying anything that addresses those problems. If this event does work, hopefully other organisers will be encouraged to try it themselves. Details of the event can be found here, including a discussion about the merit of the format and time controls. Billy Bragg turns 50 today. Just thought you'd like to know. Imagine a tournament involving Kasparov, Rogers, Chandler, Petursson, van der Wiel, Nikolic amongst others. You would expect Kasparov to easily win such an event. But not as a 13 year old. Leafing through my copy of "Fighting Chess: Games and Career" by Kasparov and Bob Wade, I saw the crosstable from the 1976 World Cadet (Under 16) Cup. Kasparov played as the USSR Junior Champion but only tied for 3rd (5th on tie break), equal with Ian Rogers (3rd on tie break). Both scored 6/9 behind the winner N.Grinberg (ISL) and Murray Chandler (NZD). Kasparov did defeat Rogers in their individual game but lost the following game to Chandler. Another future GM, Julian Hodgson finished down the list on 3.5. One thing most chess programmers do is to test their programs against a test suite of positions. Some of these suites are tactical positions (eg 1001 Brilliant Ways to Checkmate), while some are a combination of tactics and positional play. The most famous of these is the Bratko-Kopec Test, which was developed in the early 80's and was designed to measure the strength of human and computer players. The Bratko-Kopec test contains 24 positions half of which are tactical, and half of which are based around understanding pawn levers. Two such positions are shown on the right. Even with this lack of knowledge it did surprisingly well. It scored 16/24 (at 2 seconds per position), solving 9 of the tactical positions and 7 of the "lever" positions. Of the the diagrammed positions it failed to solve the first one (1.d5!) but it found 1. ... f5 in the second. So I wonder about the following. Can the ability to calculate 5 or 6 moves deep (perfectly) replace the need for any deep knowledge of the game? And are there human players who already do this? As pointed out in the comments section on Zong Yuan Zhao's GM norm, there was a strange incident at the World Junior. A dispute over an incorrect repetition claim led to a game being restarted at 11 pm, the night before the final round. One version of the events can be found at chessvibes, while the alternate position can be found by following the links from the chessvibes story. Without going into the detail of the dispute (as it is third or fourth hand by the time you hear it from me), to me there is an issue of sportsmanship involved. IF (with capitals) I refused to accept an arbiters decision, and it turned out that my refusal was based on my ignorance of the rules, I wouldn't then search for any other technical deficiencies in the ruling, but simply accept that my protest was without foundation and withdraw it. If the arbiter erred in other areas I would still inform the organisers of this, but Iwouldn't use this as justification to change the result of the game. The other strange incident was from the Commonwealth Championships in India. Apparently the organisers only had enough clocks for 80 boards, and rather than locate more, simply placed the clocks on the top 80 boards, and started EVERYONE (all 110 boards or so) playing. Once a game was finished on the top boards the clock would then be transported to the lower boards and the players would be given an equal distribution of time. Clearly this system relied upon the goodwill of the players without clocks, as it would be a simple case of not moving at the start of the game, knowing full well you aren't losing any time from your (eventual) clock. Of course I wonder how a situation came about in the first place, given that the bulk of entries should have been received in advance. Does winning from the second diagram make up for losing from the first diagram? Now I figured that 21.Qh6 should win, but then over thought in the position, and decide d that 21. ... Nh5 22.g4 was too messy, and that there must be a "cleaner" win in the position. I then chose 21.Ne7+ Rxe7 22.Qxf6 Rd7, miscounted the pieces and swapped on d8, to lose the game. In the second position (D2), my opponent realised he was worse, but (verbally) dared me to find a way of breaking into his position. As I currently control all the entry points along the d file for the rook (and king) I was able to play Ra1, Ra8, Kc4, Kb5, Ka6 and Kb7 while my opponent helplessly pushed his king side pawns. For me the two games don't balance out in the short run. Having lost the first position I then proceeded to lose my next game as well, still kicking myself about the previous round. So one loss contributes to the next. Winning the second game was nice, but doesn't necessarily help me win the following game. Nonetheless in the long term I am more likely to remember the second game, as winning manoeuvres leave a bigger impression than losing blunders. At it's most recent meeting FIDE approved a number of changes to the rules for the 2008 Olympiad. Indeed there had already been some changes passed at the 2006 Congress, and most of the recent changes were already well known to most players officials. The 2008 Olympiad will only be 11 rounds. There has been an on going push to shorten the duration of the Olympiad, either by introducing 2 rounds a day, or by reducing the number of rounds. One of the big movers in this area is FIDE Secretary Ignateous Leong. Personally I'm not in favour of either proposal, and when FIDE asked the Federations about shortening the 2006 Olympiad to 13 rounds (from 14), the PNGCF voted no (as did the ACF). The move to shorter Olympiads is favoured by FIDE because it makes the tournament more attractive to potential organisers. However it should be noted that the winning bidders for the 2010 Olympiad promised as part of their bid to restore the number of rounds to 14. Whether this promise is remembered closer to the time is another question. Consequently the pairings for the 2008 Olympiad will be accelerated for the first 2 rounds. I'm actually in favour of this, and not just because it helps the PNG team avoid it's ritual 4-0 beating in Round 1. Normally the Olympiad splits up into 4 groups after 3/4 rounds, with the big boys fighting it out at the top, and the minnows playing for pride at the bottom. Accelerated pairings should sort out the groups a little quicker. Team sizes have changed with both Womens and Open teams consisting of 5 players, with 4 players per match and 1 reserve. Again I feel this is to benefit the organisers, as there will be about 100 less players in the Open to house and feed, while there may only be an extra 70 players in the Womens. And while the PNG team has only fielded the minimum 4 players over the last 2 olympiads it does make selections harder as we have a couple of players keen to play this time. While I'm in favour of increasing the size of the Womens teams, I'm not in favour of cutting the Open Teams. The final change (and probably the most radical) is the change from gamour e points to match point scoring. This means that you get 2 points if you win your match, whether you win 4-0 or 2.5-1.5. Again I don't like this change, for a number of reasons. Firstly I think it will disadvantage the really good teams, as often the winning team got there by crushing a close rival 4-0. Instead you'll get to see a lot more grinding chess with one team winning on one board, and then trying to draw on the others. Also the spectre of "match fixing" will raise its head, as a team only needs to fix 1 game to benefit a rival rather than 3 or 4. So I'm not in favour of most of the changes, although there is nothing that can be done about that now. Only after the next Olympiad will it be clear whether the changes were good or bad for the tournament, and its players. The 2008 O2C Doeberl Cup is pleased to announce the entry of another 2 GM's. Indian GM's Abhijit Kunte (who last visted for the 2000-01 Australian Open) and SS Ganguly (who finished equal 1st in the 2007 Commonwealth Championship) have both confirmed their participation in the event. This brings the field up to 5 GM's, 4 IM's, 1 WGM and 2 FM's. For players intending to enter the Premier, note that there is a limit of 80 places for this tournament and entries have already passed the 25% mark. Also important to note is that entries are on a first come first served basis, so enter early to guarantee to place. A full list of entries (for all events) can be found here. A game from the Ukrainian Championship where White treats the French Defence with the contempt it deserves. The Knight sac on f7 destroys Black's position. The Commonwealth Championships finished in a predictable triumph for India (the host nation), although the Australian contingent would be pleased with their performances. 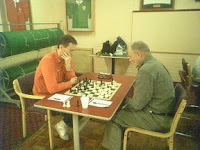 The tournament was won by former British Champion GM R.B. Ramesh (8.5/10), on tie-break over GM S.S. Ganguly. The best placed Australian players were IM Aleks Wohl, and IM David Smerdon. Wohl finished on an undefeated 7/10, including 4 draws against his GM opponents. Smerdons 7 points came from only 9 games, as he missed his 3rd round game due to illness. During the event I managed to watch some of the games on the net, including this exciting Rd 4 game between Aleks Wohl and Shashikant Kutwal. It looked like Kutwal's attack must break through but Wohl defended accurately and emerged with the advantage of 2 bishops v rook. Via Ian and Cathy Rogers comes news of Zong Yuan Zhao scoring a GM Norm in the First Saturday GM Tournament in Hungary. Zhao needed to win his last 2 games for the norm, and defeated IM's Arnaud Payen and Vinh Bui to finish on 7/9. He also finished equal first with GM Zlatko Illincic. Although the tournament website is a couple of rounds behind, hopefully this link will eventually provide more information. More success for ACT junior chess with Alfred Deakin High winning the Junior Secondary ChessKids National Interschool Chess Championships. The team score 22/28 to finish 2 points clear of Brighton Grammar School. Canberra schools were also represented in the Primary Section with Radford and Curtin Primary finishing 8th and 9th respectively. Full results here. ** Before I get bombarded with "clarification" comments I'll explain the quotes around "National". The ChessKids National Interschools Chess Championship is organised by the ChessKids business, and is in no way connected with the Australian Chess Federation's Interschools Championship. The ACF is very strong in making this distinction (including objecting to the use of the word "National"), while ChessKids is not so strident in making the distinction clear. I was having a discussion with a visiting chess player to Canberra yesterday and he asked me "How do you think the Australian Championship will go next year?" Having been through the experience of organising the 2006-07 Australian Open I answered that the Championship itself would do well, but they supporting events would struggle. Well this evening I had a look at the entries, and to my pleasant surprise it looks as though I was wrong, with the event has almost hit the 100 mark (Championship 27, Major 40, Minor 32, 99 in total). Included in the entries for the minor is a big contingent of players from South Korea, which may make tipping a winner in that event difficult. As for the championship, the recent return to form of Darryl Johansen means that I feel confident in tipping him for a 6th Australian Championship, with Stephen Solomon my backup selection. Despite the loss of the sole Australian entrant in Round 1, the 2007 World Cup is still running in sunny Siberia. The Quarter Finals are almost complete with Carlsen, Shirov and Kamsky all making through in 2 regular games. The other semi finalist will come from the Alekseev - Karjakin match which has gone into overtime. Shirov won through with 2 wins over Jokovenko, including this win with black in games 2. What impressed me about this game, is that after Shirov won 2 pieces for the rook, he simply readjusted his goals so as to kill any of his opponents counterplay. This strategy (as opposed to trying to knock his opponent out) forced his opponents quick resignation. ** Quick update: Karjakin beat Alekseev 2.5-1.5 in the Rapid playoff. Hip Hop and Chess. This natural marriage of the rhythmic and the cerebral is making it's way to Canberra as part of the Sunsets 07 Music and Arts Festival. The festival is on the 22nd of December in Commonwealth Park Canberra, and apart from 15 hours of DJ's and Dance, it also includes Art Exhibitions, Food, Drink, and most importantly "Chess Master in the Chess Pit". At the moment the "Master" may well be me, although I'm looking for (a) someone who is a real master and (b) can wear a baseball cap backwards without looking like a dork. For those readers in the Central West of NSW (Orange,Bathurst etc) the Blayney Chess Club is hosting a simultaneous exhibition by GM Ian Rogers. The event is on Sunday 16th December and will start with a blindfold simul against 3 invited players before a normal simul against all participants. Full details on the Blayney Chess Club website. This event is almost to the half way point, with Aleks Wohl the best of the Australian's with 4/5 (+3=2). David Smerdon is on 3.5, despite missing one round, apparently due to illness. Finding the current standings on the tournament website seems impossible (to me at least), but fortunately the results are also being hosted at www.chess-results.com (I should have looked there first). One of the interesting things about this tournament is that it is being held as one big swiss. When the requests for entries were sent to all the federations it stated that each federation could send representatives for the Open/Womens plus representatives for U/20, U/18 ... U/8. I'd simply assumed that they were holding separate tournaments for each section. But no. The winner of the Under 8's Commonwealth Championship doesn't get to play just other Under 8's. They may have to play big scary IM's and GM's instead. The other interesting thing is that at least 3 GM's playing in this event are likely to make the trip to Canberra to play in the Doeberl Cup. Hopefully an official announcement can be made shortly. During the third round game between Yi Yuan and Endre Ambrus at the Vikings weekender I noticed they had reached a RB v RB ending, but surprisingly Endre still had all of his 8 pawns on the board. I thought this was highly unusual and did some searching in Chessbase to try and find other examples. I discovered it was more common than I thought, and there are even plenty of examples where it is K+8p v K+8p. It was one of these examples which gets my vote as the "Most Boring Game Ever Played". For those that couldn't make it to day 1 of the Vikings Weekender, here is a shot of me with what I must say is a very impressive mustache. What you see is exactly 1 months worth of facial hair, grown from the 1st of November to the 1st of December. Here are a couple of games from the 2007 Vikings Weekender. The first is the last round clash between Max Illingworth and George Xie. The second game was played on the lower boards between Mark Scully, and Doeberl Cup organiser Charles Bishop. The game has a real 19th century feel about it, as Scully takes advantage of a lead in development to sacrifice material for a mating attack. I've also changed the photo gallery on the right of the page to show pictures from the weekend. Also held over the weekend was the 2007 Australian Schools Teams Championship. While most of Canberra's best players were battling out in salubrious Tuggeranong, 4 school chess teams travelled up to Brisbane to take on the best school teams from the other Australian states. And it turned out to be a very succesful trip for the ACT representatives with Hawker Primary winning the Primary Open, and Curtin Primary winning the Primary Girls tournament. Hawker College finished 5th (out of 6) in the Secondary Open, while Daramalan College finished =3rd (4th 3rd on tie break) in the Secondary Girls. Congratulations to all teams and parents involved. Full results can be found here. IM George Xie was the convincing winner of the 2007 Vikings Weekender, completing a second perfect day with another 3 wins, and finishing outright first on 6/6. Xie had a tough schedule, playing seeds 3,2 and 4 (Ikeda, Ambrus and Illingworth) but picked up the win in each game. Second place was shared between Endre Ambrus (beating Ian Rout in Rd 6), and Andrew Brown (who won his last round game against Junta Ikeda). Both players scored 5/6, with both losing only to Xie. The Under 1800 prize was won by Victorian junior, Justin Tan (4.5). There was a 3 way tie in the Under 1600 group between Stephen Mugford, Emma Guo, and Justin Chow (4/6), while Megan Setiabudi won the U/1400 section with 3.5 points. The final crosstable is in the comments section. The 2007 Vikings Weekender has attracted a good field of 48 players, both good in numbers, and good in strength and temperament. Top seed for the event is Sydney IM George Xie, although the second seed, Endre Ambrus (pictured playing Carl Nater, Endre on the left), is the player most other competitors are watching. A recent arrival to Canberra (from Rumania), Endre had a FIDE rating of 2400, although for some reason he is currently on the FIDE list as an unrated player (investigations into this are continuing). Other strong players in the tournament include juniors Junta Ikeda and Max Illingworth, as well as Sydney journeyman, Johnny Bolens. After the first 3 rounds 4 of the top 5 seeds are on perfect scores, with Illingworth the only player in that group to drop half a point (to Milan Grcic). Alongside Grcic and Illingworth on 2.5, are Megan Setiabudi and Justin Tan. Round 4 will see a lot of close matchups as players have almost all found their level, although separating 48 players in a 6 round swiss is always a difficult task. Crosstable after Round 3 can be found in the comments section.